Following an 11-day layoff from competition with another school, it didn’t take long for Redondo’s girls volleyball team to shake off any rust they might have accrued. Coach Tommy Chaffins kept his Sea Hawks hungry and on top of their game with strong, competitive practices and it paid off in the first round of the CIF Southern California Regional Open Division. Fourth seeded Redondo (35-3) defeated Cathedral Catholic of San Diego 25-10, 25-21, 25-20 in the opening round and will travel to take on top-seeded Mater Dei (40-2) i the Regional semifinals on Saturday at 6 p.m. Mater Dei (40-2) handed Redondo its first loss of the season with a 3-1 victory on Sept. 5. Coming off its lengthy layoff, Redondo capitalized on a strong serving game by Antonia Felix who served 10 consecutive points in the opening set and seven straight in the second set giving the Sea Hawks a large advantage. 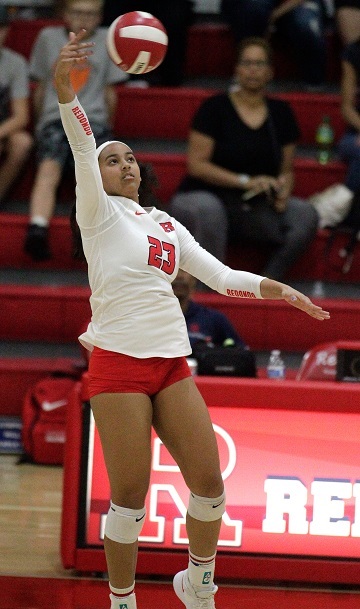 Redondo’s big hitters also had productive nights led by Jasmine Davis who recorded 15 kills. Laila Ricks added nine kills, Kami Miner had eight kills, 18 assists and two blocks, Jylen Whitten had six kills, Ava Kirunchyk posted two kills and two aces and the Sea Hawks super libero Nalani Iosia recorded two aces and 14 digs. The winner of Saturday’s match will face the winner between No. 2 Torrey Pines and No. 3 Marymount for the Regional title on Tuesday. The Southern California Regional winner will take on the Northern California winner for the State title on Saturday, Nov. 17 at Santiago Canyon College in Orange.